We're back with our morning walking exercise. While I focus on the walking and stretching part of this early morning ritual, DH is more content in looking for nice-looking flowers and plants. And I'm not just referring to beautifully landscaped front yards and gardens. No. But also to plants growing in sidewalks, empty lots, or even drainage canals that strikes her curiosity. In one of our morning walks in a nearby subdivision, DH and I chanced upon a vigorous healthy vine with beautiful flowers. The vine we saw covered much of the house owner's front fence as shown below. The robust looking vine had these gorgeus flowers that have sky blue petals and a pale yellow throat. Here's a couple of flowers from the homeowner's vine. Instantly, we decided that we just had to have this vine growing in our garden. But first I had to know what it was. 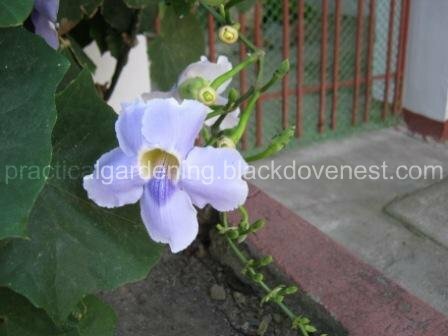 After looking around the internet, I learned that this plant is called Thunbergia Grandiflora. I also found out that there were 2 colors: lavender-blue (or sky blue) and white. 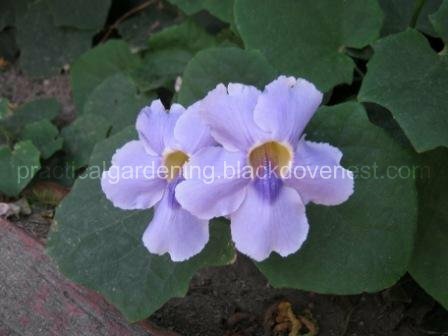 Thunbergia grandiflora is also known as Bengal trumpet, sky flower or Bengal clock vine. 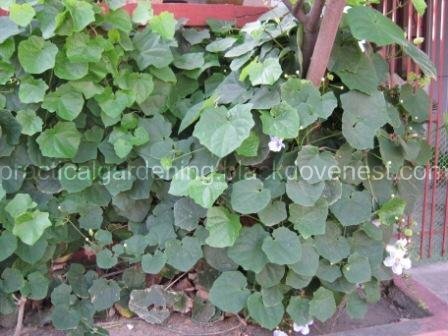 This vine is native to Southeastern Asia, and more precisely to India. It bears wide flowers that are generally sky-blue or lavender-blue. Some varieties (E.g. 'Alba') have pure white flowers. This vine can be grown outdoors in frost-free areas. (USDA zones 10b-11) It is sometimes reported to be root-hardy to moderate frosts (24°F-28°F, -2°C to -5°C) but the foliage will be damaged by the slightiest frost. Note: This vine is considered as an invasive species in some tropical and subtropical areas, including the Hawaii islands (USA), some areas in Australia and Singapore. I've seen this flower in the white color in our subdivision, and frankly, it doesn't attract my attention the way the lavender-blue type does. So we asked about the vine from the house owners. We were told that this was an old vine, and there's no denying by the looks of it. The house owner, Jerry Monteras, even expressed a bit of frustration, saying it was getting harder to maintain despite the beautiful flowers. The foliage just keeps getting thicker. Here's a picture taken near Jerry's front gate. It's a flower with plenty of peduncles. We proceded to take cuttings from the monstrosity of a vine with Jerry's permission of course. Heck, Jerry and his nephew even helped in choosing for us which vine cuttings to get. And they were quite generous, reminding us to get more if we wanted. DH, confident of her green thumb naturally stopped at getting 10 cuttings, saying those were more than enough. After all, she's had her hand with cuttings many times and saw them thrive and grow with no problems. Besides, if the plant flourished in a neighboring subdivision, then it only meant that climate and conditions in our area encouraged or at the very least, supported it. So we took the cuttings home fully confident that they'd all grow and become like the vigorous vine we just saw. For myself, I was already visualizing this huge wall trellis that I'd be building. I already even had the perfect spot for it and how tall and wide it would be. I knew instantly it'd be easy to get this vine climb up MY homemade trellis. And why not, Jerry's front wall didn't even have a trellis! Yet, the vine was just so big and kept climbing where it could. Our excitement turned into disappointment when NONE of the cuttings showed any signs of surviving. It was like almost unbelievable. I mean how difficult can it be, right? So maybe the 100% mortality rate was just a fluke. It was VERY difficult. During the next 3 months, we would go to Jerry's house 3 times, asking to take some more cuttings to plant in our garden. At one time, we took as many as 20 cuttings. I even used soil-less potting mix in one attempt just to vary the conditions a bit. We researched how else to propagate the vine by cuttings: type of cut, where to cut, etc. and how else to improve conditions where they will flourish. Here's a account from Sir Joseph Paxton taken from the 19th century. Having examined, with some care, plants of T. grandiflora which bloom abundantly, and others on which a single blossom is rarely to be witnessed, it is obvious to us that the two states are brought about solely by attention or inattention to some very trifling particulars. First, it should be potted in a compost with some pretensions' to be called rich, but not of an extremely nutritive description. That account even discusses a bit about soil preparation. Two parts of maiden loam, and the remainder of heath-soil, leaf-mould, and sand, will, if mixed, constitute an excellent material. Next, the pot to which it is transferred must be exactly of the size suited to its wants, and neither so large as to leave more than three quarters of an inch between the roots and its edge, nor so small as to check the extension of the rootlets, unless the specimen be too exuberant. Lastly, each plant ought to have an open space of at least half a foot on all sides of it, that the influence of the external aerial agents may be duly received, and that it may not relapse into a weakly state, with long, sickly branches, bare towards the bottom. And finally, some ideas on trellis construction and placement, fertilization and watering. The best mode of training for the attainment of these ends is to a small round trellis of either wood or wire, around which the shoots can be fastened in such a manner as not to grow higher than four or five feet from the stage. In the summer months this species needs watering with great liberality, and syringing rather forcibly three or four times in a week. Throughout the winter, however, it is to be kept much drier, and suffered to stand on a wooden or stone surface. Our drawing of this splendid plant was made in the nursery of Messrs. Henderson, Pine-Apple Place, whose recent culture of stove plants, and the spirited manner in which they have constructed houses for their reception, are much to be commended. It is an East Indian species, described by Dr. Roxburgh as growing " among bushes in wild uncultivated spots near Calcutta, where it flowers in the rainy season." With us it blooms freely through several of the autumnal months. Cuttings of the young wood, taken off in spring, and placed in sandy loam, plunging the pots in heating bark or manure, and protecting the whole by a handglass, will strike root with tolerable freedom. Thunbergia grandiflora has clusters of 3 inch sky blue flowers all summer and is vigorous even in shade. A native of India, the flowers and foliage make great cuts for arranging. Grow with plenty of moisture and fertilizer during the summer. Prune as desired. In one of our revisits to Jerry's house, he welcomed us to his inner garden where we learned that he loved plants of different foliage. Different shades of green, shapes of leaves and growth attracted his fancy rather than flowering ornamentals. He didn't do much propagation either, preferring to purchase his finds from garden shops. He even had a Hoya plant in his garden that he didn't even know. He just kept it for its shiny leaves. And he was pleasantly surprised to discover that this, just like our Hoya plant, would have flowers. 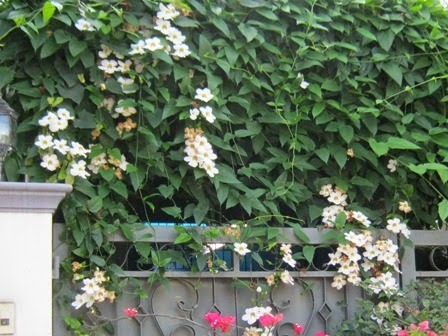 Jerry's neighbor (a former boss of his at the DFA) is also an avid gardener and actually owned the Thunbergia Grandiflora now growning on Jerry's front fence. The neighbor even had a very invasive white Grandiflora (T.Grandiflora 'Alba'), if I'm not mistaken. Here's the lush front garden of Jerry's neighbor. After learning or our failed trials with the cuttings, Jerry assured us he'll try to propagate with his own cuttings. We left our contact number with him, hoping he'll remember to call us if he becomes successful. Frustrated with our attempts to grow the T. Grandiflora via cuttings several times made us conclude that the only way to grow it is via seedlings - small T. Grandiflora plants that already had roots on it. We even entertained thoughts of layering Jerry's plant, so a branch would grow roots. Or maybe just get Jerry's plant if he grew tired of it! That's how badly we wanted this vine to grow in our garden. But then DH had an idea. She's seen plenty of Thunbergia grandiflora vines at the UPLB Campus before and so I suggested we consider that place as a potential source for propagating Thunbergia grandiflora from seedlings. I purchased this beautiful vine at a farmers market. It had such lovely flowers of blue! It grew (and grows) so fast that I had to buy an extension pruner to reach the top of the plant it had become so tall....growing on the rail and supports of my front porch. All of my neighbors say that I have the most beautiful front to my home....they even take pictures! I tried propagating the vine and was successful the first time! I got several cuttings to root in water and I gave them to one neighbor. Now they ALL want cuttings and I am having difficulty. I think that my mistake was not changing the water in the vase often enough. The first cuttings I paid more attention...later I got lazy and I think that the water was becoming a mold haven. This is what I get for being so successful with the first cuttings and telling everybody that I would start some for them also! The canes of this vine can grow two or more feet a week!!!! I must prune it every weekend....but it is really lovely. I must admit that living near the beach in southern California probably gave me an advantage. True, this is such a lovely vine yet so very invasive. I had to take it out because it was too high-maintenance. Hi i just started my t.grandiflora in indonesia. Thanks for your sharing and wish u all the best. I purchased four of them to make sure my entire fence will be covered. I trimmed them after flowering and they grew very fast and very lush. However I have no flowers! I love the green fence but I would love some flowers. What can I do to make it flower? Hi Sue. Do they get plenty of sunshine? Tropical vines do best with much sunlight. Ours flowered around September to November. It gets to rain around that time and the vines gets almost almost a whole day of sunlight. I have one (1) growing in my backyard. It has completely taken over a dead tree in just one year and created what we call our Faerie House. Some of the leaves are good 15cm long. Here in Florida we have beautiful lavender-blue flowers all year 'round.